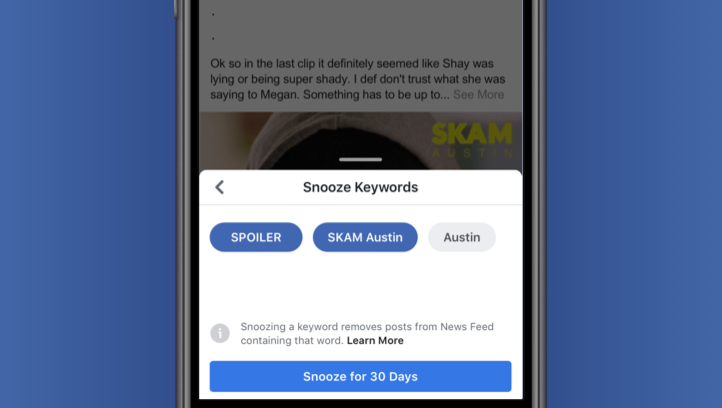 Facebook is testing keyword snoozing to block spoilers, unwanted politics, etc. Have you ever been spoiled on Facebook from a friend or relative liking a post about a certain TV show or movie? The latest Avengers film springs to mind, with Facebook being chock full of spoilers and friends and family posting everywhere about it. If that’s ever happened you’re going to love this new feature that Facebook is testing. Keyword snoozing is coming to news feed controls so that you can add keywords to block posts about. Even if you don’t care about spoilers, this feature can be used to block anything. Don’t want political posts in your news feed? Block the relevant terminology and you won’t see a thing. This feature is reminiscent of a feature Twitter added last year called “muted words.” Simply adding a word, phrase, or hashtag to this list meant that posts containing it wouldn’t be shown to you. Facebook is implementing the same thing here. There are only two limitations, the first being that the word or phrase will only be muted for 30 days, after which you’ll need to add it back to the list if you don’t want to see it anymore. The second is that you’ll need to see a post you want to block before you can block it. You can’t manually add keywords yourself. We saw something similar added at the end of last year, where you could snooze individual friends for up to 30 days at a time. The feature is currently being tested, so assumedly not everybody has it yet. Should testing be successful then we’ll likely see it rolled out in the near future to everybody. I personally don’t have the feature yet. You can check if you have the feature by tapping the top right of a post, where you can then block posts by keywords pulled from the post itself. It’s a bit annoying that you can’t add the keyword before you see a post that could potentially spoil you, but it’s better than nothing and will hopefully change in the future. You can check out the official announcement post below.